Punched paper tape is originally used by Martins as an input medium. At this stage there are alpha keyboards and no screens. 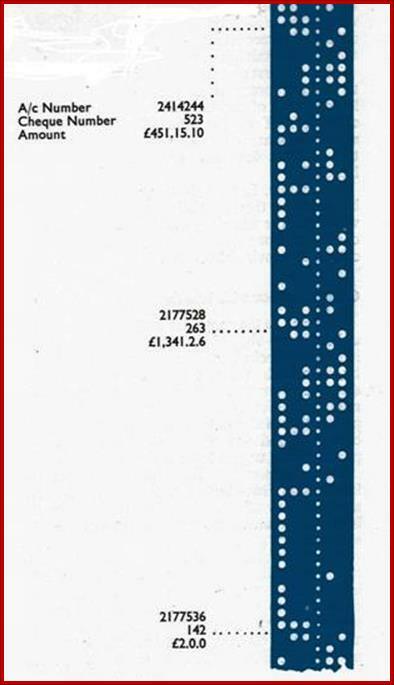 Data is physically punched in binary directly onto the tape via specially converted adding machines, and the computer reads and interprets the information accordingly. 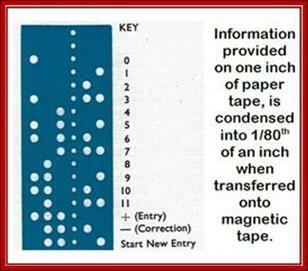 MAGNETIC tapes are used as the first form of RAM (random access memory) to store vast amount of information which is accessed by spinning the reel backwards and forwards to the desired data. At the time of Martins’ involvement with punched paper and magnetic tapes, these media are cutting edge technologies. The use of paper tapes as a source of programming for in-branch computer terminals is continued by Barclays until 1981, when the last tape fed machines, the Burroughs TC500s are phased out. A reel holds 2,400 feet of ½ inch wide magnetic tape, storing information at 800 characters an inch. A full reel can hold records for as many as 40,000 current accounts. 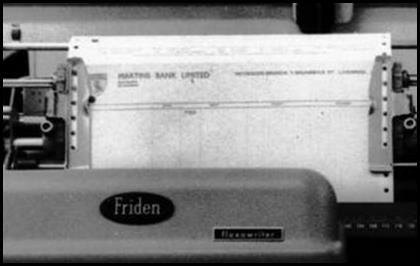 Since 1959, when Martins Bank was the first in this country to operate a computer for its own current account work, all the major London Clearing Banks have installed computers and some are now very much ahead of us in the practical application of electronic techniques. Already hundreds of thousands of cheques are being handled in the clearings by electronic devices and many tens of thousands of current accounts are being maintained by computer in a single bank. The need for these developments is seen not so much in the present situation as in the need to provide for the increases in work in the future. Current account operation and clearing operation are two sides of the same accounting process. If all the information provided in the CODE LINE at the foot of cheques and credit slips is printed in the special magnetic characters, electronic equip­ment can carry out the process of both clearing and current account operation in addition to sorting. As sixty to seventy percent of branch entries arrive from the clearing departments, it was realised by the Bank some time ago that if, when dealing with these items in an automated clearing, the pro­cessing for current accounts could be carried out simultaneously, there could be considerable economies. The question then became one of finding suitable equipment and although we kept the various manufacturers' products under review it was not until the new IBM equipment was offered that an installation tailored to the Bank's needs could be visualised. The outcome was the order for a computer installation to be sited in London. This equipment represents the first phase of the full system and includes high-speed reader/ sorters, each capable of dealing with over a thousand cheques a minute, reading all the information appearing on the code line, sorting the cheques by the sorting code number and placing entries into the current accounts operated by the computer. The three sorters will be in­stalled in advance of the computer and manual sorting will be transferred to them in the first instance. This stage, which should be achieved during 1965, will not greatly alter branch methods, as clearing acknowledgment will continue as now. The computer itself is unlikely to be installed before the spring of 1966. Thereafter the effect on the clearing system will be felt as the computer will control a part of the sorting power and the development of a fully automatic clearing system will begin. At first the computer will deal with only a part of the cheque clearing, the rest being sorted without computer control. The automated clearing system will result in branches receiving their clearings together with a list produced by the computer so that reconciliation will not be dependent on the acknowledgment as it is at present. Simultaneously, the computer will have the power to deal with the current accounts of thirty-six branches in the London area. When the clearing cheques arrive at one of these branches they will already have been tested against the accounts and the branch will be told which cheques are stopped and which will run an account into debit in excess of the agreed limit. It will also deal with Registrar's Depart­ment accounting and will be able to make full use of the new type of travellers' cheque and advice, the reconciliation of which will require the absolute minimum of human intervention. Thus the first stage of the operation will reduce to modest proportions the very monotonous hand-sorting of cheques and later will relieve the clearing staff of the difficulties of reconciling acknowledgments received back from branches two or three days after the cheques have been handled. Ultimately, further electronic equipment will be added to the installation by which time the whole of the clearing will be automated and computer operation of current accounts will extend to provincial centres. To bring to the computer the work originating at branches—about 30-40 per cent of a branch's items—a punched paper tape will be produced by the branch. Where a branch is situated some distance from the computer centre, telecom­munication devices will be used to transmit the paper tape information between branch and computer and will also provide the means of passing back urgent information to the branch. The computer will have facilities to receive information from branches, no matter how far away, by way of a telephone line feeding directly into the computer without any intervention from an operator. Much research has been necessary into pro­cesses associated with computer operation. For instance, the encoding of amounts in E13B characters to enable the reader/sorter to read automatically all information needed for current account and clearing operation still presents a number of difficulties and we are discussing these with manufacturers as well as making trials of prototype machines produced for such a purpose. Very considerable difficulties have been ex­perienced in developing a satisfactory method of personalisation which involves printing on all cheques the account name and account number, the latter in the special characters suitable for automatic reading. We have co-operated exten­sively with one manufacturer in developing a suitable machine which we are already using experimentally and which we shall be using for the first branches to be converted to personalisa­tion in readiness for the London system. We have provided a testing ground for a service operated by a cheque printer and have carried out tests with other types of machinery in an attempt to solve this very difficult problem. There seem to be endless difficulties in the way of such a radical revolution in banking methods as is now being attempted. It is not sufficient for us to take the results of our experiences on the present computer and simply convert these for operation on the new machine: it is important that we should make full use of the more power­ful facilities that will be available. The new computer will be capable of carrying on more than one operation at a time: it can print lists or statements at 1,100 lines a minute, it can read paper tape at 1,000 characters a second and, as an example of its speed of calculation, it can complete an addition in 1/30,000th of a second. Speed of calculation is not, however, very significant in this type of bank work; speeds of addition up to two million a second are practic­able with modern computers but would contribute nothing to our operations. The computer can do all these things and many more but the development of the method of operation (called programming) requires great care so that the features are used to the best advantage. There is a tendency to produce more paper the faster the computer can work, but this is not the best way to develop a system and our aim is to make the computer do as much to control and test its own work as possible. The team of analysts to produce this new system will be gathered from the members of the staff and will need training before they can embark on the task under the guidance of those already ex­perienced in this type of work. They have before them a period of two or three years of difficult and arduous work but this is probably going to be one of the most fascinating periods of deve­lopment ever experienced by bank staff. In our computer centres, in addition to the computer room itself, there is a separate "print-out room" in which three Flexowriters (shortly to be extended to five) are provided. These machines automatically tabulate across the page to the appropriate position for each item of print under the control of the paper tape previously punched out by the computer on a Creed 3000 high speed punch operating at 300 digits per second. The Flexowriter also automatically seeks the correct position to start printing on each of the statements fed continuously to the machines. Provision is also made in the computer room for a line printer.